Roman Victory: 12 Banners—Romans score 2 Banners if they manage to eliminate Mithridates. They also can receive 1 Banner if Mithridates is forced to evade off the map. All Mithridatic & Roman Leaders may cancel a retreat or a sword hit if present with the unit. Units on both sides involved in close combat with the support of a Leader may only count one helmet hit amongst those rolled to inflict a hit on an opposing unit, unless King Mithridates or Pompey is the supporting leader---then up to two helmet hits may be counted. Units and the Rally Card:. No unit can be rallied to beyond five blocks or its strength at the start of the game whichever is less. If a Player rolls “swords” when attempting to rally he may freely chose which unit gets a block back. The following types of infantry units in the game on the Roman side are assumed to be Roman Legionaries: ALL Roman Heavy & Medium Infantry. Each Roman Legionary Infantry unit starts with a Pilum Marker. The Pilum is a one-time use weapon that is generally fired right before a Roman Legionary unit attacks in close-combat or is itself attacked by the enemy in close-combat. Once the Pilum is fired the Pilum marker is removed from the Roman unit to indicate that the Pilum has been expended and the unit may not throw Pilum for the rest of the battle. Just before a Roman unit with Pilum is attacked or is itself attacked by the enemy for the very first time in the battle in close-combat it throws its Pilum—roll one die and apply normal hits for swords, color, or a Flag/retreat hit Afterwards remove the Pilum marker. The act of throwing the Pilum is not considered to be part of the Close-Combat—so any result of the Pilum throw is resolved before the Close-combat. 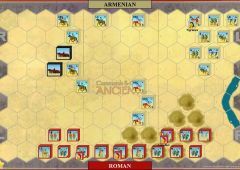 An attached Leader may use his special ability to cancel a “swords” hit that was inflicted via a Pilum hit (see special Command rules) on the unit he is stacked with. Roman units, adjacent to the enemy, that have not expended their Pilum may also be ordered to throw Pilum if the card “Darken the Sky” is played by their commanding player. 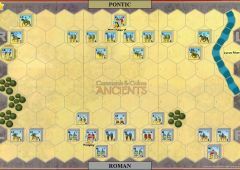 The Player picks one adjacent enemy unit and throws two dice –apply the results just as one would before close combat—and remove the Pilum Marker. 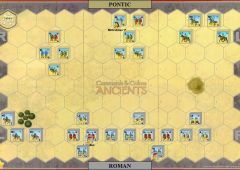 Adjacent and on the same side Roman Legionary Infantry, instead of moving, may switch places in a “Relief/Cohort Maneuver”. Relief/Cohort Maneuvers may only be conducted through the play of Section cards ONLY. 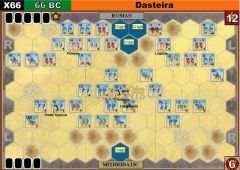 Instead of ordering one unit via a section card, the controlling Player may order a pair of adjacent Legionary Infantry units to switch hexes—at least one of the units switching places must not be adjacent to an enemy unit. A unit that switched places via the Relief/Cohort Maneuver into a hex adjacent to the enemy may close combat in the same player-turn. 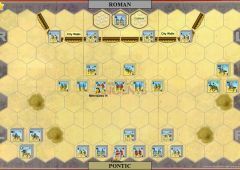 Roman Legionary Non-combat Ordered Moves: Legionary units ordered to move with any card except “Double Time” or “Line Command” may move two clear terrain hexes as long as they do not start or end or pass through hexes adjacent to enemy units. The Roman Slinger units hit on swords when executing missile fire & battle-back. 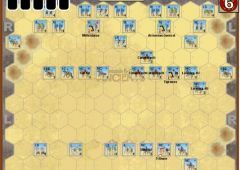 Roman Cavalry Discipline: Roman Medium Cavalry only retreat 2 hexes per Flag result taken. Mithridatic Player unless the unit is a Cataphracti Heavy Cavalry unit involved in the close-combat or battle-back. Mithridatic Cataphracti: ALL Mithridatic Heavy Cavalry is heavily armored—therefore they always ignore the first sword hit inflicted upon them in close-combat or battle-back, or hits from missile or pilum fire. Mithridatic Heavy Cavalry may never evade battle, and unlike most other Mithridatic units hit on sword rolls as noted above. Mithridatic Horse Archers: When missile firing at a three hex range Mithridatic Light Mounted Archers do so with only 1 dice regardless of whether or not they have moved. 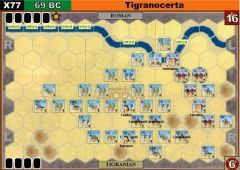 On the very first Mithridatic Player-turn only Light Foot and Light Cavalry units can conduct Ordered Moves or attacks—all other Mithridatic units (and Leaders) may not be ordered on that player-turn at all. Missile range is only two hexes during the first three player-turns for BOTH Players due to night conditions. 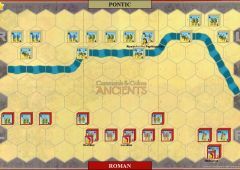 Mithridatic units and leaders may voluntarily leave the map by exiting from hexes A1 to A6 inclusive on the map-edge. 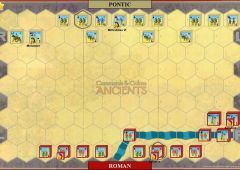 Mithridatic Units/Leaders that start their own player-turn occupying these six map-edge exit hexes & that are ordered by the Mithridatic Player via a section card only may voluntarily exit the map at the player’s option. Unit/Leaders exited voluntarily never count as lost for the Banner count and can never return. 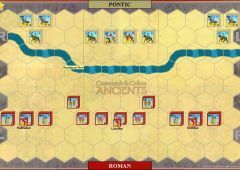 King Mithridates may not voluntarily exit the map if the exits for that player-turn will result in more than six Mithridatic units being left on the map at the end of that player-turns move. 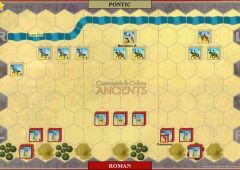 The Pontic General Leader may not voluntarily exit the map if the exits for that player-turn will result in more than nine Mithridatic units being left on the map at the end of that player-turns move. 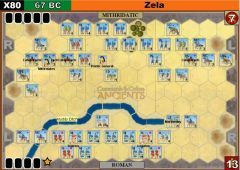 Mithridatic Leaders that start their player-turn stacked with an exiting unit leave with that unit if that unit is ordered via a section card, and may not violate the restrictions that apply above. Effects of being Outflanked: “Outflanked” units when battling back roll only half the normal number of dice they would be normally entitled to rounded up—to a maximum of only two dice—“Outflanked” units when battling back never hit on helmet rolls even if supported by a leader. A unit’s “Outflanked” situation is judged at the instant it battles back. If a player’s Army Leader is still on the map he may, at the start of his own player-turn, choose to discard three cards from his hand and redraw three more cards in lieu of executing a regular player-turn ---this may only be done in place of taking a normal player-turn (the normal player-turn is skipped over and the enemy player now has the option to conduct a normal player-turn or do a discard for his hand). Neither Player can conduct this discard option during their first two Player-turns of the scenario. 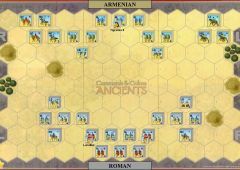 Hills: The Hills are assumed to be very steep (since this battlefield is inside some type of mountain pass)—Ordered Movement into a Hill Tile (even from another Hill Tile) by a unit may only be made if a unit starts its ordered move in an adjacent hex. Once the Hill hex is entered the ordered move ceases in that hex. Cavalry units may not conduct Momentum attacks from Hill hexes and their Momentum moves stop in such hexes. Use all other normal hill hex rules.